Health Optimization programs begin with a one-hour coaching session that includes an assessment of lifestyle habits that are and are not serving the individual well including: nutrition, which is discussed as eating strategy; sleep hygiene; stress management; exercise prescription; and self care. The objective of this service is to identify triggers and create a comprehensive action plan that addresses specific changes that can be made to have the greatest impact with the least amount of disruption to the individual’s day-to-day. Subsequent sessions will continue the process of assessing, experimenting, analyzing and adjusting as you make changes to determine what strategies deliver the results you desire and are sustainable in the long term. Individuals with Health Optimization Coaches experience a level of guidance that goes beyond traditional fitness training, FiT Health Optimization Coaches work at the level of life coaches and health advocates. 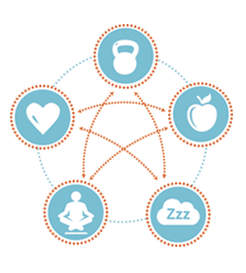 Working with you to address all five domains, resulting in a state of health that is not possible with exercise alone. In addition, Health Optimization coaching ensures sustainable results not attainable with quick fix solutions.